Casa de la Paz, a beautiful Mexican Casa in the heart of San Pancho in the Nayrit Rivera, is a relaxing peaceful place to unwind. Located in the heart of a small Mexican fishing village. Enjoy the ambiance of cobblestone streets, horse riders, and the chickens and other village critters abound. The casa is located within easy walking distance for shopping, dining, and recreational activities, including the beach. This two bedroom two bath casa is beautifully furnished with locally crafted furniture and artwork. The large kitchen is fully equipped with a large gas stove and refrigerator with freezer for your culinary delight. Poolside patios and terraces provide serene, restful areas away from the main casa. Housekeeping, pool, and gardening services are provided two days per week with additional days available. My wife and I are retired teachers in California and built Casa de la Paz in 2004 as our retirement home. After retirement we became grandparents (ten wonderful children) and our retirement plans were altered. We now enjoy San Pancho several times a year and rent it when we are not able to be here there. We built Casa de la Paz in the heart of the village because we wanted to be walking distance to all of the benefits of this lovely pueblo. The furnishings and art work in the casa are all fom local craftsmen. We love the Mexican culture and wanted our home to reflect this. While the outside colors are neutral (except for the beautiful gardens), the inside of the casa is alive with vivid colors. There are several different outside patios to enjoy the pool and gardens. Fans and A/C are in all rooms. We have a golf cart for rent, for $35 usd per day (15% less than local rates). Showers in both bathrooms as well as an outdoor shower to wash away the beach sand. All rooms have their seperate air conditioning unit. Ceiling fans are also in all areas of the casa. All linens are furnished. In addition housekeeping services are provided two days per week. Additional housekeeping service can be purchased. The washer and dryer are available for clients who stay for a week or more. Covered single car, 3 walled garage with access to patio and swimming pool. Broadband internet wireless connection is available through the Telemex connection. All furnishings and art are locally crafted. The microwave is tucked into the spacious kitchen island. Nicely equipped kitchen with a gas stove (6 burner) and oven, microwave, full size refrigerator, and kitchen island is ready for your gourmet cooking enjoyment. Beautifully hand crafted by local furniture maker. Seats eight comfortably. Beautiful gardens attract birds and butterflies. Besides the patio area around the pool, there are several other patios and terraces. A covered outdoor tiled terrace with two tables and chairs ajoins the entrance. A brick terrace with umbrella table and chairs stands above the pool; and a small private patio in the rear of the property boasts a banana tree. There is a beautiful local 9 hole course in town. In addition we have a four seat golf cart available to cruse our beautiful pueblo. It rents for $35 usd a day (15% less than local rates). Please, smoking only in outside terraces or patios. The filtered, unheated 32'x12' pool, complete with tiled dolphins, is wonderfully refreshing. Our family stayed in this lovely home for 5 nights. The home is cozy, and the setting could not be better. The only issue is the roosters- so I recommend keeping the windows closed at night to dampen the noise. We spent two weeks at Casa De La Paz and loved every minute of our visit. San Pancho is a special town with lots to see and do and Casa De La Paz is located within a very easy walk to everything you might need or want to see. The house and garden entrance is gorgeous and the housekeeper Melana is helpful and keeps the place in tip-top shape. As for previous complaints about the roosters crowing, I actually love that sound. We never were disturbed by any noise at night and only heard the roosters that live next door in the morning. I only hope that we get to return sometime in the future. Lots of privacy, great pool, lovely landscaping, great kitchen and awesome location close to everything in town and beach. The house was roomy and spacious with a great kitchen and dining room. Communicating with the local property manager Eduardo helped out a lot when we had questions checking in. The Roosters were a little noisier than we'd have liked, even by Latin American standards, but you can close the windows and turn on the A/C. We thoroughly enjoyed our stay! Throughly enjoyed our stay in San Pancho at Casa De La Paz. It’s a lovely home with a beautiful courtyard and pool area. The kitchen is well equipped, throughout the house are charming Mexican style furniture and artwork. Would definitely recommend this home to enjoy a relaxing and charming environment in the heart of downtown area. Everything is in walking distance, yoga, coffee shop, restaurants and beach area. A great place to stay and enjoy a little of Mexican culture and hospitality. Would certainly love to return again and vacation in this comfortable home. Very nice, a little loud. We loved the house and walking to town. We had everything we needed and loved San Pancho. The roosters and dogs next door were loud but nothing that earplugs couldn’t handle. 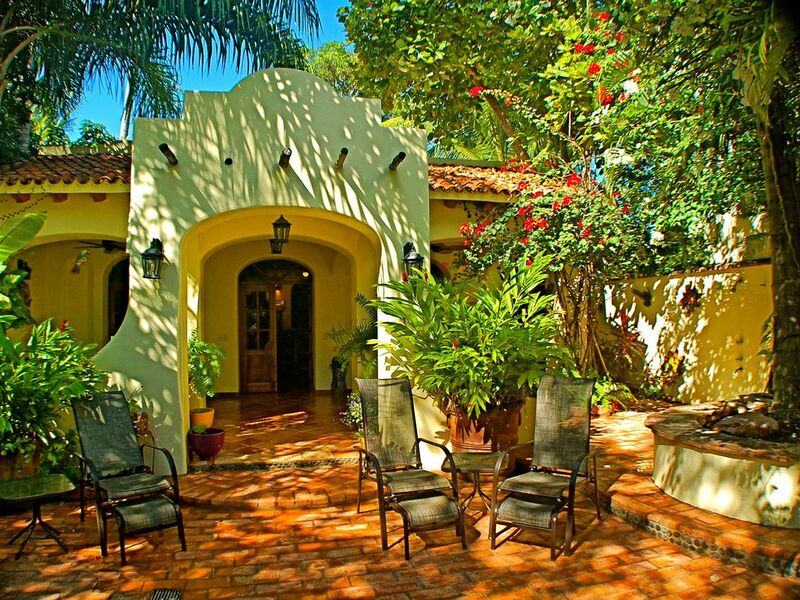 Casa De La Paz is a beautiful and charming casita right in the heart of downtown San Pancho. This is our third stay in SP and we felt this home is the perfect place for a restful and fun vacation. It has everything you need for your holiday: a great kitchen to prepare your own meals (although the restaurants in town are fantastic and only steps away! ), a washer and dryer, a golf cart and beach chairs. The rooms are cozy and filled with Mexican arts and crafts. The pool and garden is a lovely spot to sit with a glass of wine after a day at the beach. The new wireless speaker provided great ambiance every night. Another great benefit, the home is right across the street from an amazing yoga center, El Estar, where we practiced every single day of our holiday. The house manager, Eduardo, was responsive and available anytime we needed him. The house was kept clean by twice weekly home, pool and garden cleaning. We will definitely be back next year to stay at Frank and Bonnie's lovely home! Honestly...this was one of the most idyllic spots in our many travels around the world. Casa de la Paz is located in the heart of the village within easy walking to all of the pueblo's amenities.